Tram said ‘Click It’—So I thought, yes, I’ll do that! Here’ the LUAS banana yellow advertising tram crosses the River Liffey in Dublin. On the side of the car it says ‘click it’. Gosh, I’m glad I brought my Lumix! 1) Use your foreground. Unless you’re a ballast enthusiast, avoid emphasizing the ballast. Too many railroad photographs suffer from excessive foreground clutter and other distracting elements, so when you’re composing an image pay attention to the bottom of your frame. 2) Watch your focus. Although most modern cameras have auto focus systems, too many use center-weighted auto-focusing sensors. These produce an unfortunate side-effect of encouraging novice photographers to center their subject, which tends towards bland and ineffective composition. More advanced cameras have tools such as variable focus points and focus locks that help you get around the centering problem. 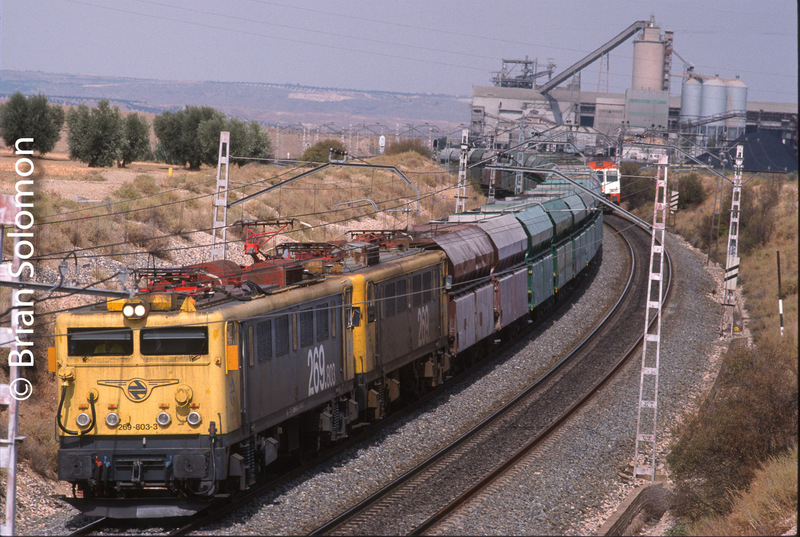 Although an imperfect image, take notice the focus: A center weighted autofocus system may have resulted in the front of the locomotive appearing soft, while the hoppers at the center of the image being tack sharp. Alternatively, I may have had to alter the composition to suit the failings of the auto focus system, which would have produced a compromised photo. 3) Avoid Flare. One of the reasons traditional photography technique stressed over the shoulder lighting was to avoid the unpleasant effects of lens flare. This is caused when the primary light source hits the front element of your lens and cause streaks and patterns across your image while lowering overall contrast. You can make successful backlit photographs by finding ways to minimize direct sun or other primary light sources; stand in the shadow of a tree, building or other object; no shadows available? Make your own with a flat piece of cardboard, book, or spare copy of TRAINS magazine. One last point: while you should avoid flare, this doesn’t necessarily mean you should eliminate it entirely. In certain circumstances, a little flare can improve a photo. Watch the way Hollywood uses flare for dramatic effect. To make this backlit shot work, I used a 28mm wide-angle lens and shaded the front element with my left hand to avoid unwanted lens flare. Notice how the clouds and foreground elements frame the primary subject, adding interest and balance without becoming overly distracting. Also, would a dark colored locomotive have produced an equally effective photo? The effect of slight backlighting on a silver train can result in a dramatic effect. 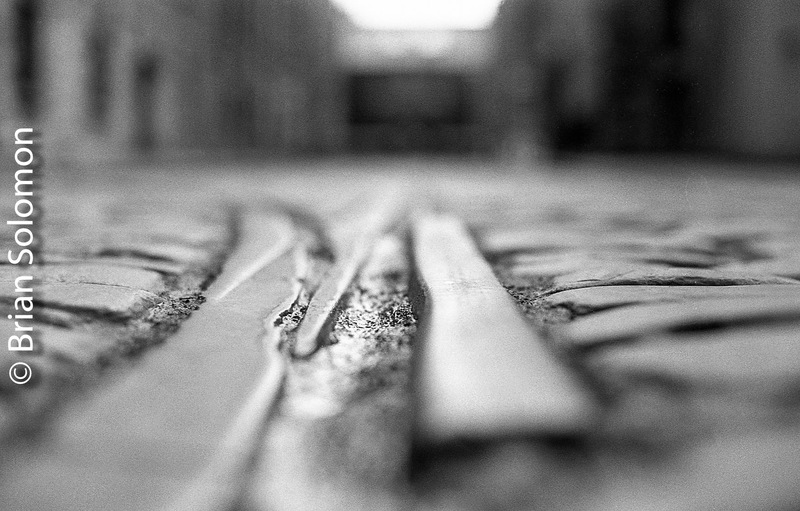 I made this view of disused narrow-gauge industrial tracks imbedded between the cobbles on Rainsford Street near Dublin’s Guinness Brewery to demonstrate the effects of shallow depth of field. Exposed on Kodak Tri-X using my battle-worn Nikon F3 with Nikkor 50mm f1.4 lens. Top Ten Reasons to Make Photographs in 2018. Too often I hear veteran photographers provide excuses for why they haven’t made photos in a long time. Here’s a tip for YOU in 2018, ditch the excuses and find the time to make photographs. 10) It’s a great excuse to travel. 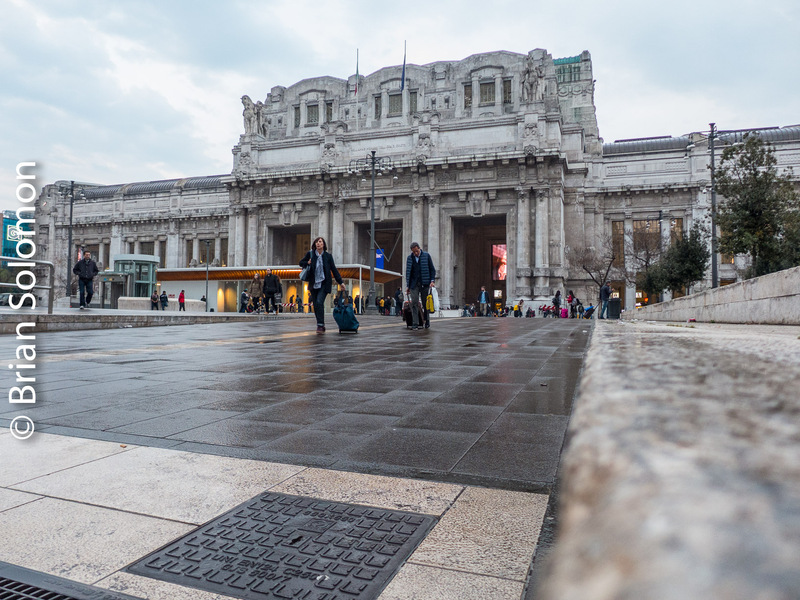 Milano Centrale. Exposed with my Lumix LX7. 9) It’s a great motivation to get out of bed. I don’t want to miss the morning liner! Exposed with my FujiFilm XT1. 8) I might need new material to keep Tracking the Light fresh? 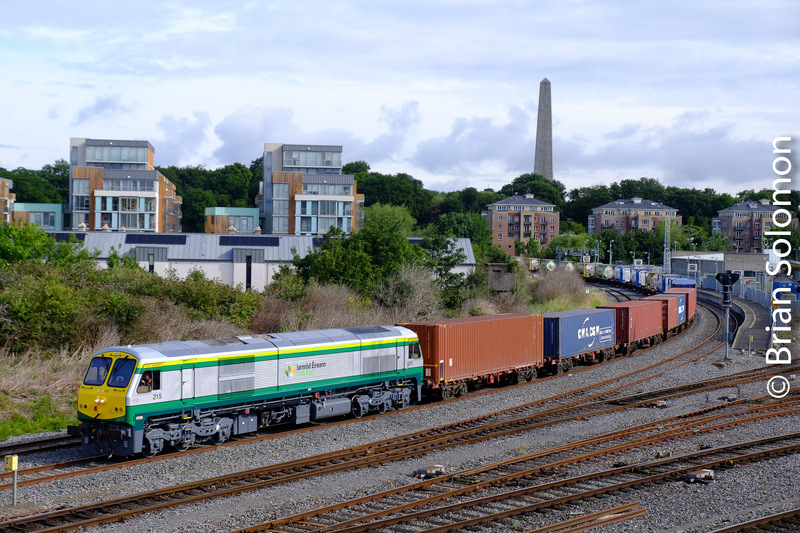 New England Central on the move. 7) I want to revisit old places to look for new angles. 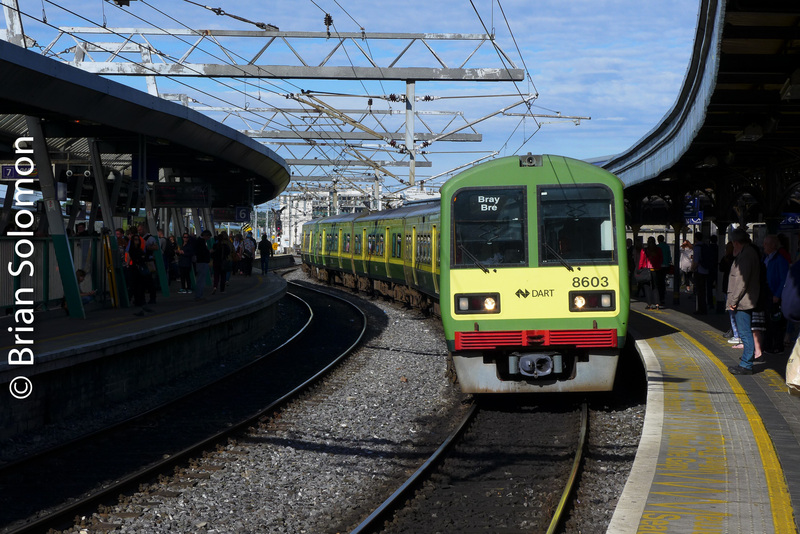 I’ve made hundreds of photos at Dublin’s Connolly Station, but I’m always trying to find something a little different. 6) I want to revisit old places to make dramatic then and now comparisons. Back in the 1980s, I made a lot of photos at the Palmer Diamond. I made this one in December 2017. I’m using a composite feature on the camera to simulate the effect of a model railroad. 5) I like to experiment with equipment, photographic techniques, lighting conditions, and new locations. 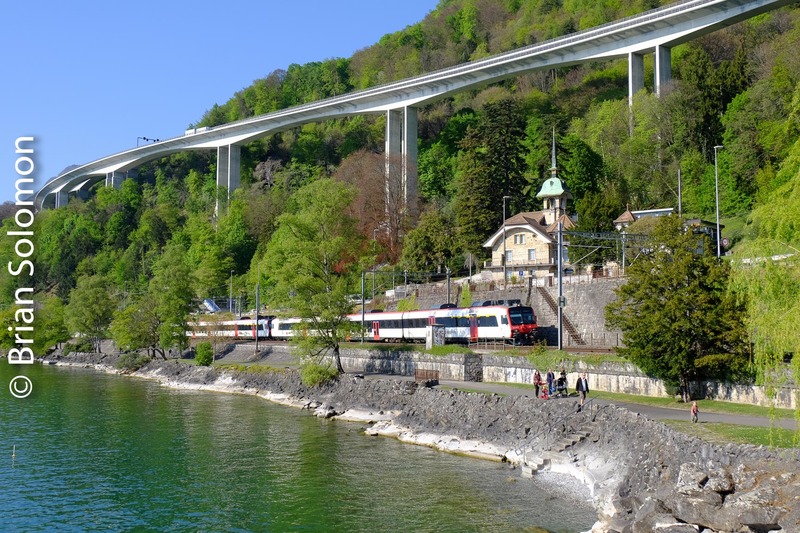 In April 2017, I made my first trip to Lake Geneva. 4) Things are on the cusp of change (really) and there’s no better time than now to photograph. Just because a railroad has been around for more than 20 years, doesn’t mean it will be around forever. Get your photos before it’s too late. 3) It allows me to explore history. The Railroad Museum of Pennsylvania allows you to step back in time. Lumix LX7 photo. 2) It gives me great opportunities to spend time with my friends. I took lots of railway trips with my friends in 2017. 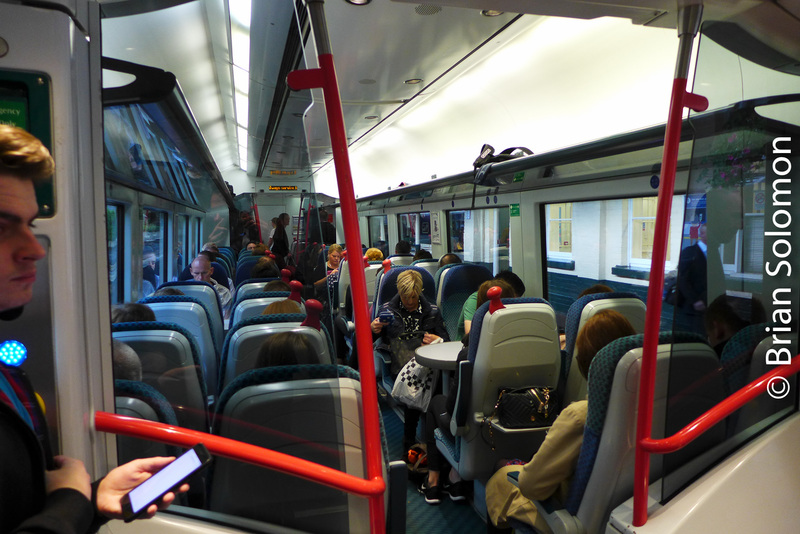 This is a view on Northern Irish Railways. 1) I like being around railways and their inherent sense of motion and commerce. PCC cars on the move in Philadelphia. Using my Nikon N90S with a Nikkor AF 35mm lens, I exposed these Provia 100F slides at Rome’s Porta Maggiore in September 2017. I often expose color slides in addition to digital images. I scanned the slides using a Nikon scanner with VueScan software. My initial scans are made at very high resolution (4000 dots per inch or higher) and then using Lightroom I scaled these for internet presentation. Are these photos better than the digital images? I don’t know. My film photos have different characteristics than the digital images. Also, I like to give slide shows and I find it’s much easier and more satisfying to project original color slides than put together digital presentations. Slide film works well in certain contrasty situations such as this one. An antique narrow gauge tram makes a station stop near a centuries old Roman wall at Porta Maggiore. The November 2017 issue of Trains Magazine, pages 16 and 17, features my column with suggestions for improving your photography. I offer some simple and obvious suggestions, but more importantly I challenge some common assumptions and provide some valuable counter-intuitive advice. The nice thing about advice is that if you don’t like it, you can ignore it. Oh, and by the way, in case you were wondering the photograph used to illustrate the article was exposed with my FujiFilm XT1 with the Zeiss 12mm lens often mentioned in this blog. Conrail versus CSX; West Warren on the Boston & Albany Then and Now. Ok, how about then and when? (click on the link to Brian Solomon’s Tracking the Light to see the modern view). These photos were exposed 28 years apart from essentially the same place in West Warren, Massachusetts. One view was made of an eastward Conrail freight in March of 1984; the other of an CSX freight at almost the same spot on November 15, 2012. In both situations I opted to leave the train in the distance and take in the scene. Conrail eastward freight grinds upgrade on a dull March 1984 morning. Exposed on black & white film using a Leica 3A with 50mm Summitar lens. CSX Q264 (carrying auto racks for delivery in East Brookfield, Massachusetts). Exposed on the morning of November 15, 2012 using a Lumix LX3 with Leica Vario-Summicron lens. Over the years I’ve worked this vantage point with a variety of lenses, but I’ve chosen to display these two images to show how the scene has changed over the years. In the 1984 view notice the code lines (the ‘telegraph poles’) to the left of the train and the scruffy trees between the railroad and the road. Also in 1984, the line was 251-territory (directional double track). Tracking the Light displays new images every day. Thursday Extra Post: Follow up view! In relation to this morning’s post; Mass-Central on Ware Hill; Boston & Albany’s Ware River Branch in a Modern Context, I’ve received several comments (and email) suggesting that a view in between the two I originally presented might be a superior alternative. I don’t concur, but I am willing to offer this photo as a potential third alternative. I had had my FujiFilm X-T1 set to ‘turbo flutter’ (continuous fast) and so exposed a great many images in rapid successionat this location. Sometimes Tracking the Light posts more often than once per day! Would you believe that 35 of 38 frames of this roll of 35mm film were exposed of the Köln Haubtbahnhof? Back in August 1998, I was working with an old Nikon F2 and three lenses, I wandered the platforms of this great station to preserve it on black & white film. I processed my film at the Gallery of Photography in Dublin and made a few proof prints at the time. Köln Hbf in August 1998, exposed on Ilford HP5. Looming beyond the station is the famous Dom, Köln’s massive gothic cathedral. Köln Hbf in August 1998, exposed on Ilford HP5. The images presented here were scanned digitally from my original negatives using an Epson Prefection V600 flatbed scanner and adjusted in post processing using Lightroom. For color photos of the Köln Haubtbahnhof and many other stations check out my new book: Railway Depots, Stations & Terminals published this year by Voyageur Press. Tracking the Light Posts Original Content! New Haven Line Detail—Seeing Beyond the Whole. Metro-North and the State of Connecticut have received 405 M8 electric cars from Kawasaki. These now dominate commuter operations on the New Haven Line. On Sunday November 8, 2015, I spent the day making photos underwire, and exposed many detailed digital photos of the new electrics using my FujiFilm X-T1. 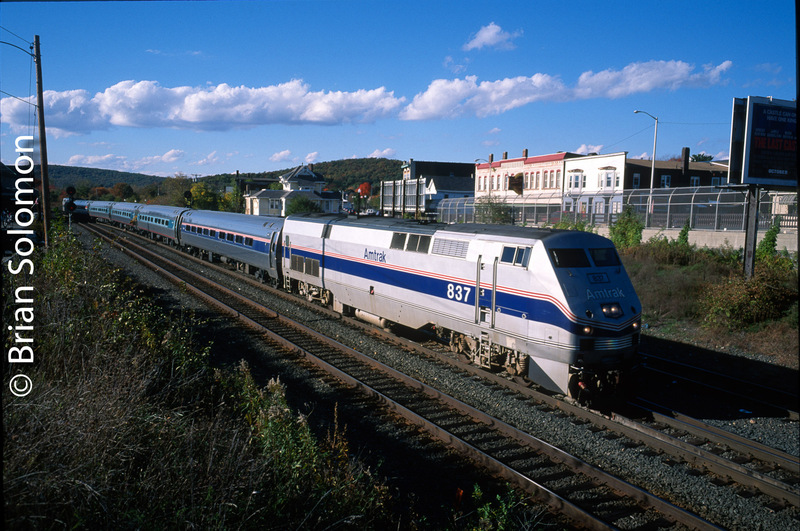 These cars are unique to Metro-North’s electrified New Haven Line suburban trains. Yet, after a few hours, they can get a bit repetitive. My challenge was remaining interested in the subject, while searching from new angles and new ways to portray the cars on the move. Which of these photographs is your favorite? Metro-North train 6524 from Grand Central at Westport, Connecticut. M8s crossing the Westport drawbridge. Third rail shoe for working to Grand Central. Faiveley pantographs for high-voltage AC overhead. Conductor gives train 6538 the highball at Green’s Farms. Sunset on a westward train heading for New York City. It will be dark by the time it reaches the Park Avenue tunnels. Panned photo at Norton Heights. CSX Emerges from the Shadows—Middlefield, Massachusetts. On the afternoon of July 1, 2011, I heard a heavy westward freight ascending Washington Hill near the old Middlefield, Station. It’s been a long time since there was a station here, but the site remains a dramatic place to photograph the old Boston & Albany line. I got into position for some photography. Nice afternoon sun and inky shadows; what’s the best way to work this? Canon EOS 7D with 28-135mm lens set to 135mm; 200 ISO, f7.1 at 1/500th of a second. I set the exposure manually, using a meter reading off the ballast. If I’d let the camera program select the exposure, it would have likely over-exposed the front of the locomotive (in other words the front of the engine would appear too light.) The reason for this is simple; the camera meter program would have tried to balance the scene for the dark shadows. Here experience with the equipment, knowledge of the location and an appreciation for light and shade allowed for correct exposure of the scene. To accentuate the effect of the grade, I used a telephoto perspective, while setting my focus on the front of the locomotive. I waited for the right moment when it was in full sun. I made a sequence of images, but for me this one best captures the drama of the scene. Brian’s “black and white challenge”-Part IV. CSX at Sunrise, Palmer, Massachusetts. A westward freight catches the glint of the morning sun. Would the photo be improved, if let the train come closer? I like the inky gloom on the right side of the image. Working with my old Leica 3A—a camera I’ve been using on and off for some thirty-odd years—I made this image of CSX’s westward Q293 at Palmer, Massachusetts on the morning of October 5, 2011. My lens of choice was a 21mm Super Angulon, which tends to vignette a little in the corners. I processed the film using my customized chemical formula that makes the negatives easy to scan. This image received virtually no post-processing after scanning, except to remove a few dust specs and to scale for internet presentation. Sometimes the old cameras yield the most satisfying results. Some of my earliest photos were made with this same camera-lens combination. Tracking the Light presents: Palmer, Massachusetts February 24, 1988. In keeping with the spirit of Otto Vondrak’s Facebook challenge, I’ve dug into my scanned black & white negative file and found this old black & white photograph from the days or yore. A Conrail crew welds the Palmer, Massachusetts diamond on February 24, 1988. A Central Vermont freight waits in the distance. Photo by Brian Solomon ©1988. I exposed this using my father’s Rolleiflex Model T that was fitted with a ‘super slide’ 645 insert. I processed the film in Kodak D76 at the Rochester Institute of technology. Back in 1988, I made prints from the negative back, but the full-frame image presented here is from a scan of the negative made in more recent times. Tracking the Light post new material daily! Spread the word and share this post. 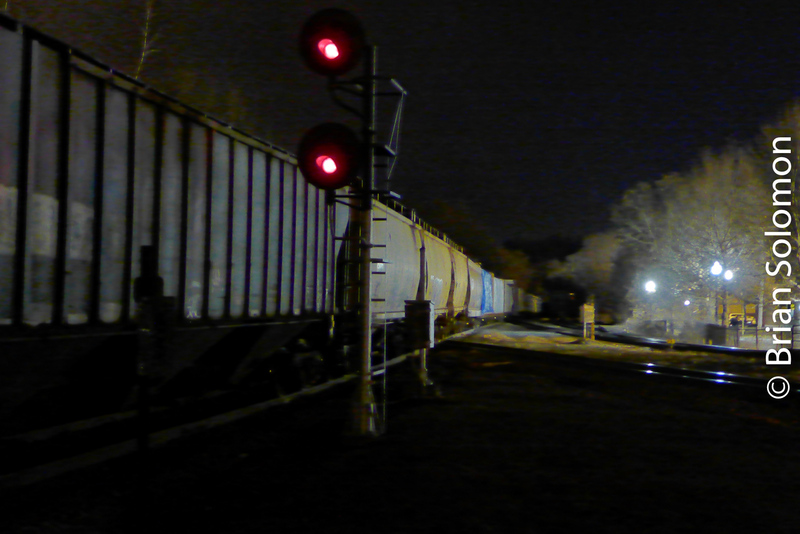 Streamliners at Spencer; Friends and Faces—TRACKING THE LIGHT Special Post. Finding Familiar Faces Among the Masses. Chicago & North Western 411 and friends. Canon EOS 7D photo. For me, the Streamliners at Spencer event was a great opportunity to meet friends, old and new. In addition photographing the equipment, I photographed the photographers. Below is a small selection. I’ll post more tomorrow! For more Streamliners photos, click on Tracking the Light’s Streamliners at Spencer page. Photographers at night. Lumix LX-7 photo. LX-7 photo at Salisbury station. In glow of Saturday evening. Lumix LX-7 photo (before my second battery went flat). Media man in Salisbury. Lumix LX-7 photo. Norfolk Southern’s Wick Moorman addresses Spencer. Canon EOS 7D with 200mm lens. Master of three-D photography. Lumix LX-7 photo. Norfolk Southern Museum. LX-7 photo. Waiting on the Piedmont at Salisbury. Lumix LX-7 photo. Waiting for the turntable to spin. Lumix LX-7 photo. 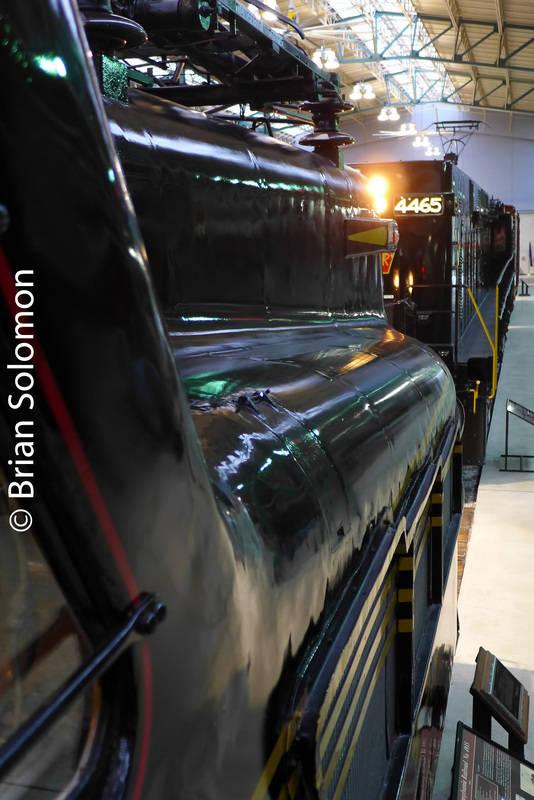 Check out more of my Streamliners photos, click on my Streamliners at Spencer page. Pan Photography: Why and How. June 2008. Exposed with a Canon EOS 3 on Fujichrome slide film. I made this pan of a Blue Line light railcar on the streets of Long Beach, California while researching my book Railroads of California. Panning is one of my preferred techniques for making a dynamic image while separating the subject from the background. This can be especially useful on dull days where a lack of contrast makes for bland scenes, or in complex urban environments where the subject maybe lost in a tapestry of intersecting lines. It’s also a great way to compensate for harsh lighting. Some tricks for making successful pan photos: select a slow shutter speed (1/15 -1/60th of a second), aim for a broadside angle, and follow your subject while releasing the shutter as you move. Use smooth lateral motion. Do not stop panning once you release the shutter. Practice repeatedly. 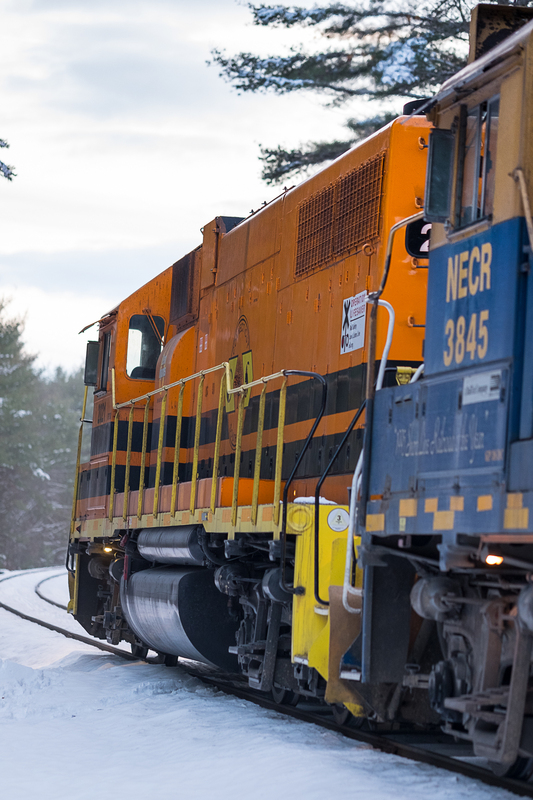 I exposed this image of Pan Am Railways GP40 310 leading MOED on the afternoon of February 17, 2014. By any measure this scene posed a difficult exposure. 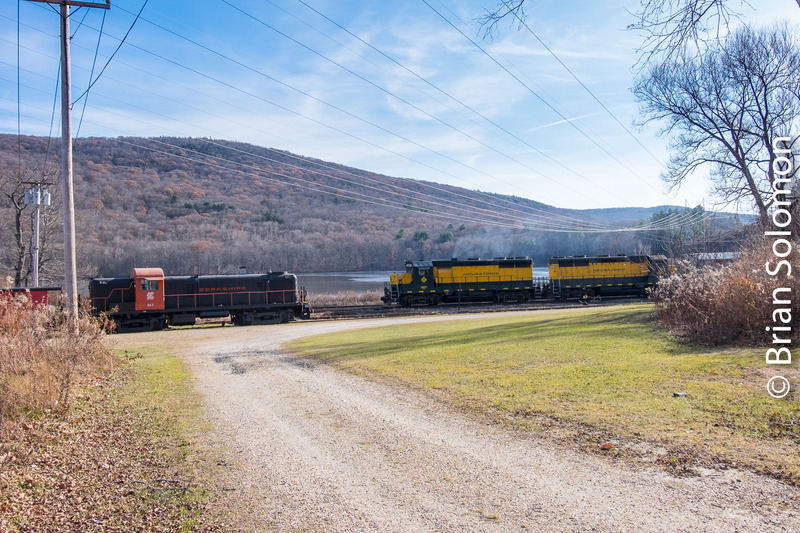 Canon 7D in-camera Jpg of Pan Am Railways 310 east of Shelburne Falls, Massachusetts. To my eye, this image appears too bright. Had it been a color slide I’d say it was about a half stop ‘over exposed.’ This Jpg was created using the Canon’s picture style profile called ‘landscape’ (one of several built in Jpg picture styles). The locomotive is a dark blue, while the scene posed a full range of tones from bright white snow to deep shadows. The train was moving, and there was little time for exposure bracketing. 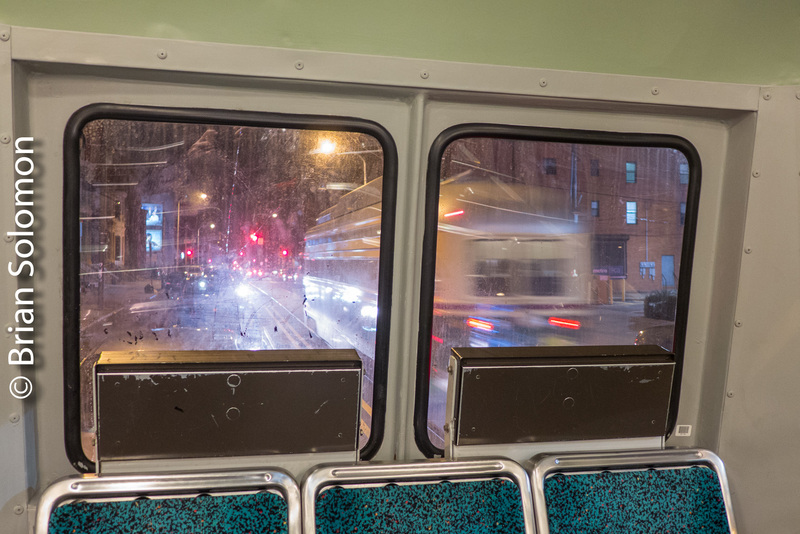 Using the camera’s histogram, I’d made a test exposure before the train came into the scene, and then made a series of images focused on the composition. Working with my Canon EOS 7D, I always expose simultaneous Jps and Camera RAW files. Most of the time the in Camera hi-res Jpg proves acceptable, and simply archive the RAW files for the future. However, in this instance when I got home, I found that the in-camera Jpg appears to bright to my eye. I re-checked the camera’s histogram for that file and confirmed that the image was exposed correctly. Instead of using the image at the back of the camera, or even the photo on my home computer screen, to judge exposure, I use the histogram. This graph allows me to select an exposure that maximizes the amount of information captured by the camera on-site. I converted the RAW to a Jpeg manually, which produced a result that matched the scene. This retained excellent highlight detail in the snow, produced a pleasing exposure for the side of the locomotive and hills beyond, while retaining good shadow detail in the tree at the left. Here’s the camera RAW file. This has not been interpreted by in-camera processing to conform to a pre-established ‘picture style’. The result is perfectly exposed. I simply converted the file to a Jpg manually and scaled it for display here. I did not adjust exposure, contrast, or color. In other words it was an easy fix: there was never really a problem with the file, only with my perception of how the ‘landscape’ style Jpg had interpreted the image. I did not manipulate or adjust the file except to scale the image and convert it to a Jpg for presentation. (the RAW file is far too large to up-load effectively). San Francisco, Boston and Milan!